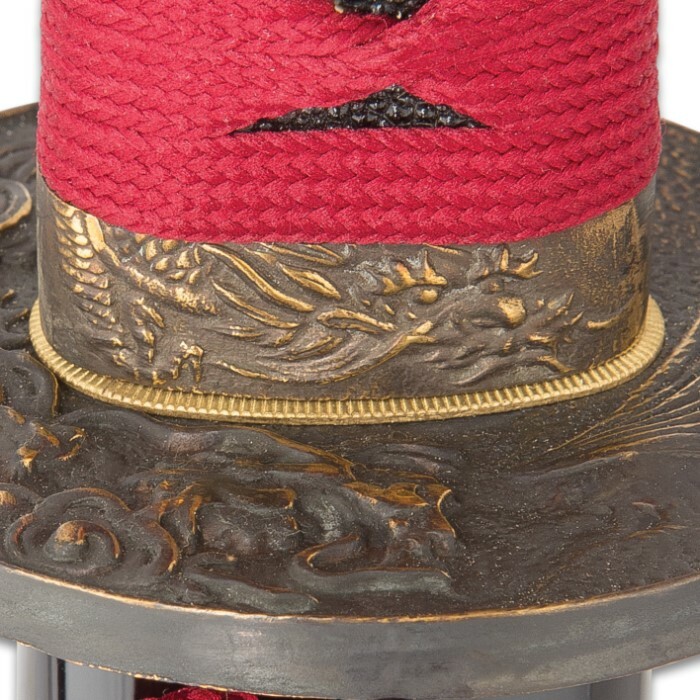 Sokojikara Pearl Zen Handmade Katana / Samurai Sword - Hand Forged, Clay Tempered 1045 Carbon Steel - Mother of Pearl Dragon Inlay - Ray Skin; Bronze Tsuba - Functional, Full Tang, Battle Ready | BUDK.com - Knives & Swords At The Lowest Prices! 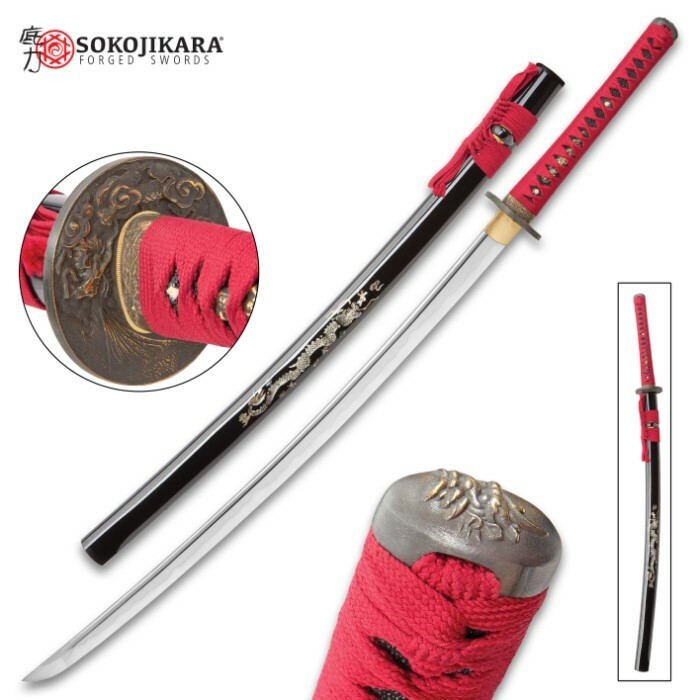 A masterpiece of color, form and potency, Sokojikara's "Pearl Zen" Katana is traditional Japanese swordcraft at its finest. 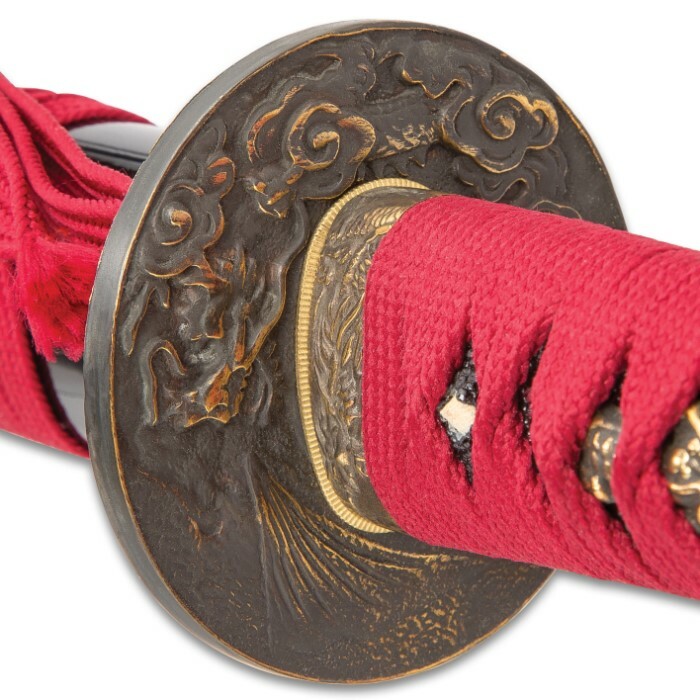 Seasoned artisans skillfully handcraft each of these rare gems, using the same premium materials and meticulous attention to detail found in some of the world's most coveted, sought-after swords. 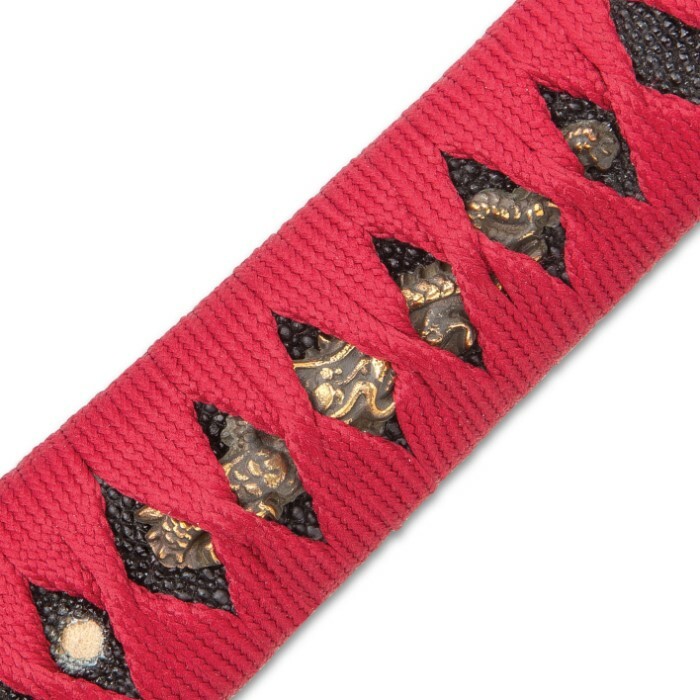 Delicately textured genuine ray skin cloaks the tsuka, offset by brilliant scarlet cord and a subtle, intricately formed bronze menuki. 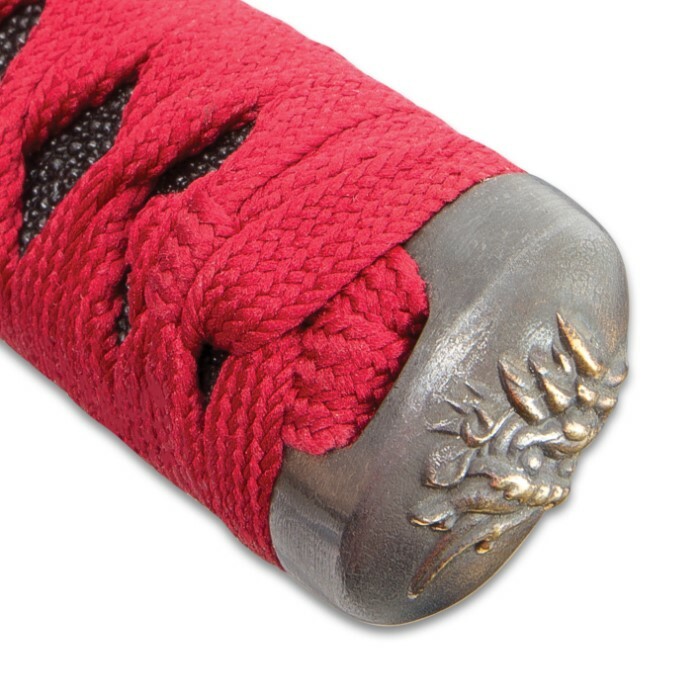 Traditional bamboo mekugi firmly wed the Pearl Zen's tsuka to the blade tang beneath, just like the storied katana wielded by samurai centuries ago. Bookending the tsuka, the flawlessly cast bronze tsuba and kashira showcase swirling floral patterns and enchanting dragon motifs - every detail rendered in stunning relief. Even the hand-lacquered saya is lavishly appointed, boasting a colossal pearl-inlaid dragon motif that's nothing short of breathtaking. While it's easy to get lost in the Pearl Zen's ornate trappings, don't forget that beneath this gorgeous facade lay the soul of a savage - a noble savage, perhaps, but lethal, nonetheless. We allude, of course, to the Pearl Zen's powerful, imposing blade. Master swordsmiths in the legendary sword-making village of longquan painstakingly hand-forge every Pearl Zen blade from rugged 1045 high carbon steel, employing a unique differential hardening technique to achieve an edge with sharpness and resilience that knows no equal. Called clay tempering, the ingenious process - unique to Japanese swordcraft - was developed centuries ago by Edo-period smiths and is integral to the katana's longstanding reputation as the "sharpest weapon on earth." Prior to the intensely hot hardening phase, smiths coat the newly formed, unrefined blade with clay - a thin layer along the edge, thicker on the body and spine. When the blade emerges from the hardening forge, the contrasting clay layers cause the steel to cool at slightly different rates, yielding two distinct hardness regions. The edge cools faster and is harder for greater impact resistance, edge retention and strength; conversely, the body and spine cool more slowly, rendering it "tougher"- less brittle and better equipped to absorb impact energy. Clearly visible along the entire length of the Pearl Zen blade, the hamon line represents the boundary between the two divergent hardness areas, a natural result of the clay tempering process. 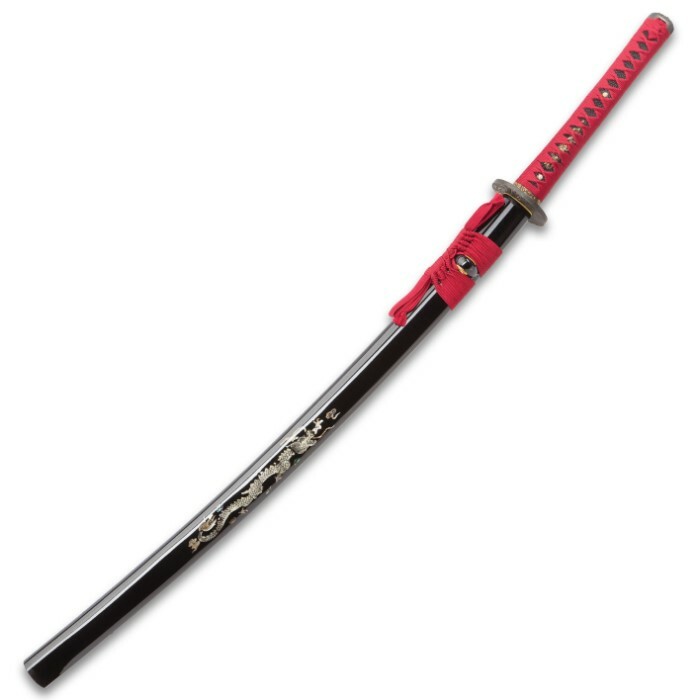 I had mine about year or so and i have to say it still my favorite katana. 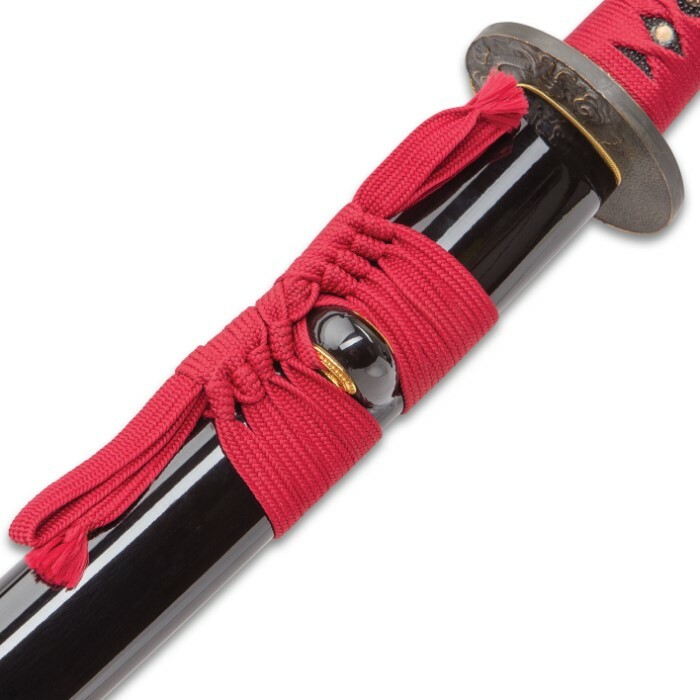 Its a very beautiful sword, the craftsmanship is amazing, definitely worth the price and i brought over 5 katana from true swords, fast shipping and each one of them are a thing a beauty. I love this site 10/10, everything i own is from true swords.